of silk, paper and tanned hides. 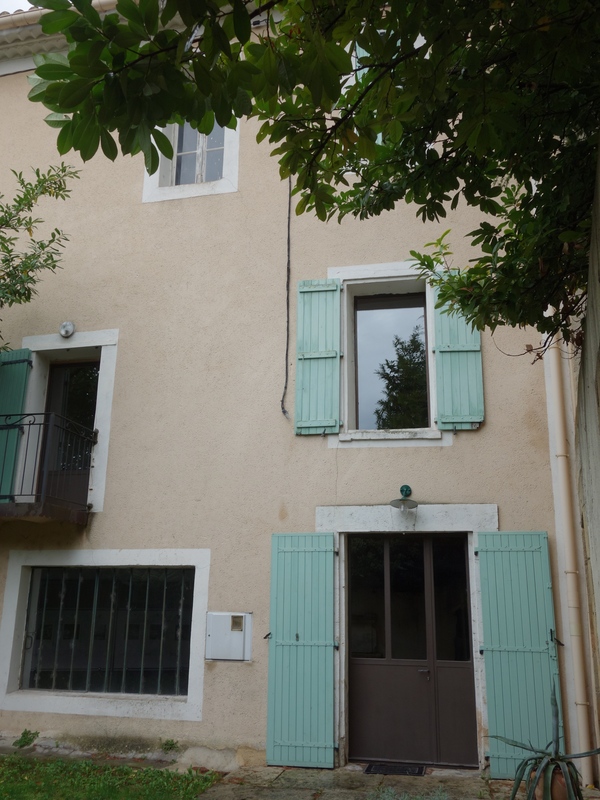 It is about an hour west of Avignon and very close to the popular Luberon Forest with its hill towns. 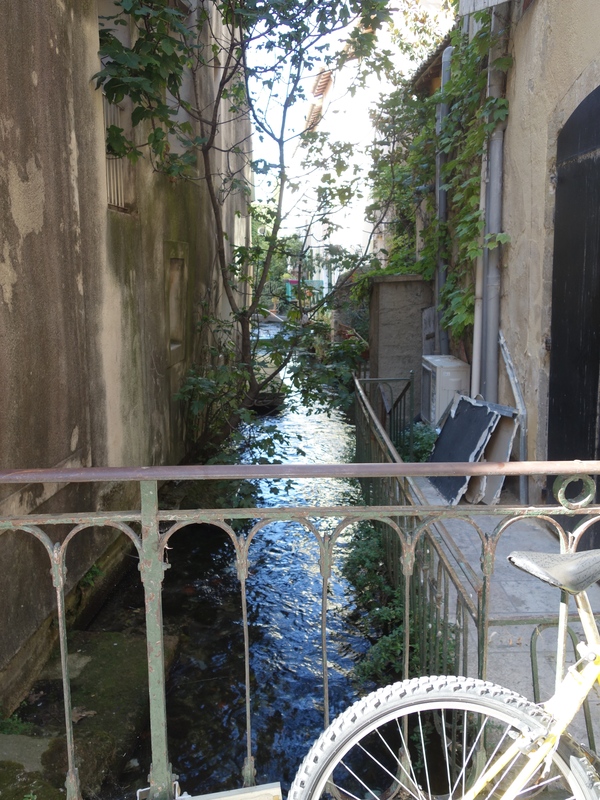 We traveled so far to the first couple of towns – Gordes and Rouissillon – and have plans for another day trip in that direction soon.. This 18th C. building has been an inn, factory and a home. Charlie joined us yesterday for a week, and we took a great excursion today to taste wine and see the country around Chateauneuf de Pape and other parts of the Cotes du Rhone region. Once we get back to the U.S., if any of you invite us over for dinner, we would be happy to share what we learned about wine-tasting techniques. We can explain the French term, terroir, if you like. 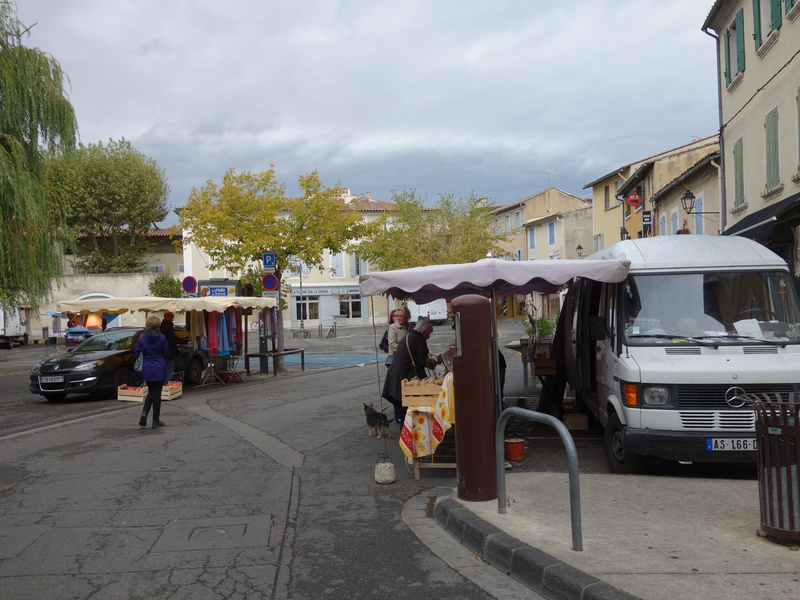 On the other hand, we also were psyched up in advance for the Thursday market here in L’Isle sur la Sorgue. But as perhaps you can tell from the accompanying photos here, it seems to be a little overrated. Now, it could be that it is just late in the season. We are holding out hopes for the Sunday market, which is by reputation the largest antique market in France. We will let you know. Meantime, Pat just went out to the boulangerie down the street for the morning croissants, and I will fire up the espresso machine. I wonder if Donald is contemplating a wall to keep out the French. The Broom’s new swale is no Sorgue. No waterwheels and no restaurants, although today there is enough stormwater moving through it to run the mill *and* water the horses. I am envying your warm, fresh croissants but will have to settle for cinnamon toast and a cuppa in front of the gas fireplace. Fun to follow you. Oh no! I hope the Sunday market happens. Keep us posted! How fun to virtually be there with you and enjoy it through your photos and narrative. Your place sounds wonderful. Hope the Sunday market lives up to expectations. We are doing our best here in the PNW to fill up lakes and rivers and hopefully not too full…. Wine tasting tips? You betcha!